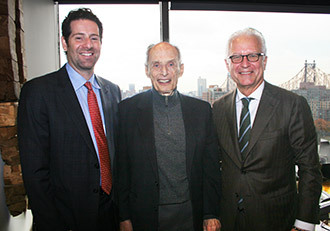 The entire faculty and staff of the Weill Cornell Medicine Brain and Spine Center mourn the passing of Nobel Prize-winning neuroscientist Paul Greengard, PhD, who died Saturday at age 93. Dr. Greengard was Vincent Astor Professor and head of the Laboratory of Molecular and Cellular Neuroscience at Rockefeller University as well as the director of the Fisher Center for Alzheimer’s Disease Research. I am personally and professionally saddened to learn of Dr. Greengard’s passing. He was one of the driving forces behind our understanding of how brain cell communicates – truly one of the great minds in neuroscience. And we had strong professional and personal connection with him as well, through collaborations between his laboratory at Rockefeller and ours here at Weill Cornell. Dr. Greengard was awarded a Nobel Prize in Physiology or Medicine in 2000 for his discoveries about chemical messaging in the brain and the role it plays in movement disorders such as Parkinson’s disease and mental health conditions, including schizophrenia and bipolar disorder. His work inspired hundreds of other scientists to continue and expand on his findings, and his influence is widely acknowledged in neuroscience. Dr. Greengard was also devoted to increasing diversity in scientific research. He received a $400,000 award as part of his Nobel Prize and used it to found the Pearl Meister Greengard Prize for women in biomedical research, in honor of his mother, who died while giving birth to him. Among the many distinguished winners of the Greengard Prize were Elizabeth Blackburn and Carol Greider, who went on to win the 2009 Nobel Prize in Physiology or Medicine. We are grateful to Dr. Greengard for his many years of ground-breaking research as well as his dedicated mentorship of the next generation of neuroscientists.